After a few minutes I realise that the people in the car are much quieter than normal. Thankfully the road is in pretty good condition, and some sections are being graded as we drive through. The road grader, basically a desert snowplough, is flattening out the regular bumps – corrugations – that form on the road over time. It’s these regular bumps that can be the real soul destroyer of long trips on dirt roads. They shake the fillings from your teeth, and buzz up the steering wheel and into your arms. When you take you hands off the wheel – an action that is only recommended when the car is not moving – you can still feel your hands vibrating. Long exposure to this type of thing would probable cause some form of industrial injury – Corrugation Induced Finger Buzz (CIFB) or something similar. In reality the unsealed section of the Mereenie Loop Road from Alice down towards Kings Canyon is not all that long - no more than 200 km – and not all that rough, but the journey seems to take much longer than expected because of the need to travel at speeds that do not awaken the pet crocodile sleeping in the rougher sections. Luckily for us, he does not wake during the trip. “ Camels!” Sal shouts, and we pull up to a sudden dusty stop. The red devil on our tail briefly overtakes the car and as it clears, there they are – some of the only wild camels left in the world. They are the ancient grandchildren of the animals from the days before rail and road links cut through the desert. Standing way into the distance looking completely at home in the red desert and at the same time alien in a land of marsupials. They turn and walk away from the car – I decide not to take any pictures of camel bums in the distance. A little further on we see feral horses. And then by the side of the road a donkey, its standard issue grey coat tainted red by the dust. It pulls one ear back over its head as we slow, and looks at us with that half comical, half sad, look that only donkeys can muster. If ever an animal was going to clear its throat and speak a few words of wisdom is was going to be this one. But it doesn’t. A silent grey desert oracle, surrounded by red sand and a huge blue grey sky, waiting to cross the road. We find another horse beside the road, but this one never made it safely over. Birds of prey – at least two Wedge Tailed Eagles and three or four Kites – gather around and on the carcass. A U turn brings us back towards them, but they take to the air before I can focus. They all seem heavy bellied with food, grateful for a feed of carrion. It’s not prime beef; but things seldom are. The left flank of the horse is open to the sky and piano key ribs show pale through the bright red flesh. Kites drift in thermal circles above the car; the eagles are nowhere to be seen. It would be good to retreat to a modest distance and see if the birds return. My family think otherwise and we move off; the dust soon obscures the view back. A few rain spots slick the windscreen. The dust clogs to a red paste on the wipers. Remarkably we pass two riders on bicycles, peddling in low gear up a hill we are descending. I hope that the horse does not smell too bad. By a shallow roadside pool a yellow, thin-faced dog lifts its head from drinking and looks towards us. The dingo stays still, unfazed by the car or the camera long shots. For a while we watch it watching us. It dips its head for a final drink and turns tail to leave. Looking back over its shoulder it trots into the stringy looking vegetation. And then it’s gone; just like that. 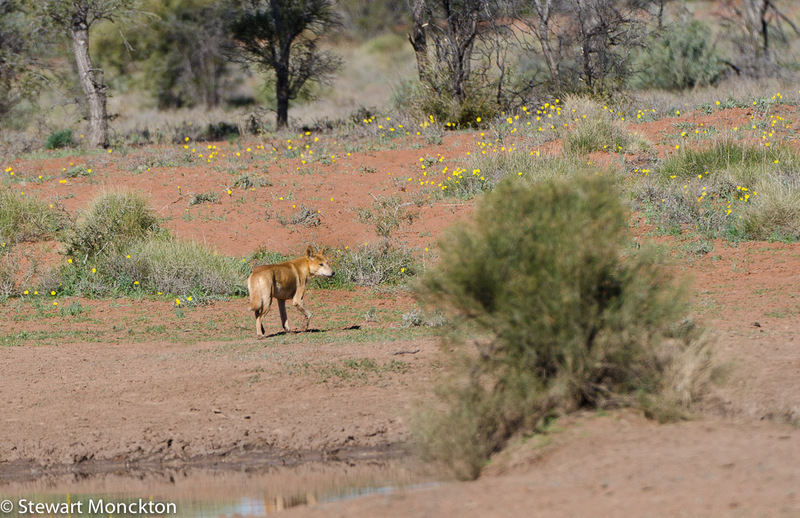 Dingoes are a pest to some, and icon to others. The wolf at the door or the spirit of the wild, hunting in the gaps between bush and sand and growing in the fertile ground of our imagination. We keep driving; past parrot trees and magpie trees; past flocks of small, fast moving finches and slow moving hawks, turning circles, drifting overhead. There are ghosts of last summer’s fires everywhere. Blackened stalks, fallen trees and stones scorched blue-brown by the flames. It’s an open landscape, which for all its grandeur and scale, is rather dispiriting in this form. And strangely it’s also a landscape I don’t recognise at all, despite having been here before. The last time I drove down this road, it was in a car, which despite its design features was more suitable to supermarket car parks than unmade roads. I think the fear of the crocodile must have been upon me, for all memory of that journey is lost – apart from the name of the car and a clear understanding that should we drive down this road again, we would not do it an a car called “Donald”. I notice a straight line across the road ahead. It’s a fence. The tyres buzz over a cattle grid and a near silence descends as we drive back onto the welcoming grippy smoothness of the tarmac. 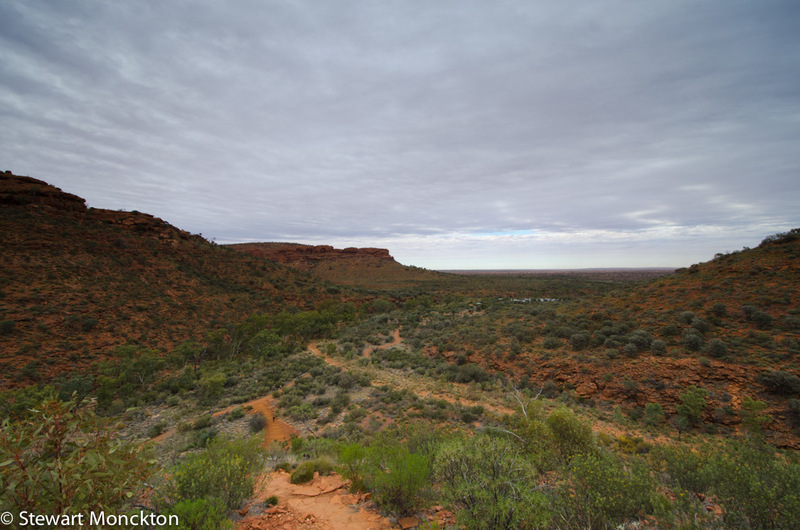 We have reached the Watarrka National Park, and a little further on we turn off the road near Kings Canyon. The accommodation is both a destination and waypoint on the road to the Centre, but we will stop for a couple of days. We eat dinner to the sound of band of such unifying badness that even the kids agree it’s rubbish. Such a singularity of musical appreciation is becoming rare these days, as H explores his own musical tastes and P embraces her inner disco queen. P is called up on stage where she is given a plastic violin and a broken bow. Ever a natural, she hams it up. On returning to the table she delivers a line so cutting that it makes her father proud! Well-handled sarcasm in the hands of a befreckled eight year old is a wonder to behold. She complains her dinner is cold, but firmly rejects H’s offer to eat it for her. We walk out into a star bright night, and shiver a little in the cold. Clouds and rain must have slipped in overnight; the morning sky is a pale, listless grey and the ground around the parked cars is ring fenced with red mud. The quality of the staff at breakfast is superior to the systems they are asked to operate. The kettle runs out of hot water. The plates are stacked away from the food and the buffet trays are largely empty. Some people complain. Others recognise a group of underpaid staff are doing the best they can. The serial complainers point out that there are no cornflakes. By any stretch of imagination the breakfast is not tasty, but the behaviour of some of the other guests is completely tasteless. The whole family are nevertheless happy that the band from last night seems to still be asleep. 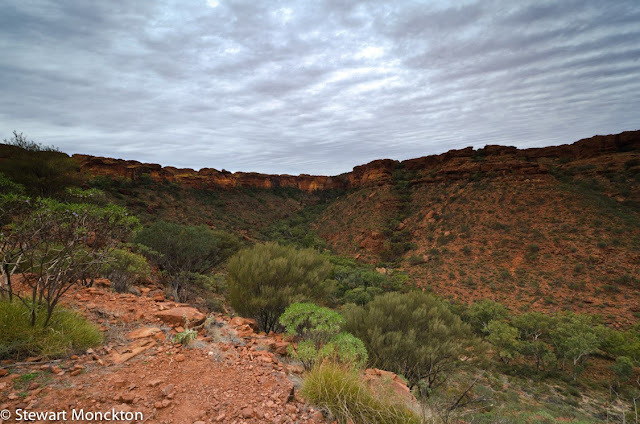 It’s only a short drive to the entrance of Kings Canyon. In one of those annoying coincidences almost everybody seems to be arriving in the car park at the same time – the delayed early risers, the hurried and breakfastless and a coach group that seems to have banned the wearing of natural fibre clothing, but encourages the possession of wide brimmed hats and walking poles. After a few hundred metres of mingling with the crowd we reach a decision point. We either head along the floor of the canyon, or break off left, up a steep looking ridge that rushes out towards us. It’s not really a decision, as we are already committed to the ridge. Thankfully the majority of walkers choose the canyon floor – and we part ways from throng and head steeply upwards. The metallic clinking of walking poles recedes into the distance, keeping perfect time with a column of bobbing hats. From the decision point the floor of the canyon doglegs away from us, so a spur coming in from the other side of the canyon hides the steep walls for which it is famous. This is a walk that opens up only as you proceed, keeping its secrets for at least a little while. Rough, well-worn steps wiggle up the spur. The kids jump between some of the steps, just because they can. I stop to take photographs, just because I can. Sal walks to the top without stopping, just because she can. We gather at the top, just off the path, for jelly snakes and water. From here you can see miles in one direction, and not far in the other. 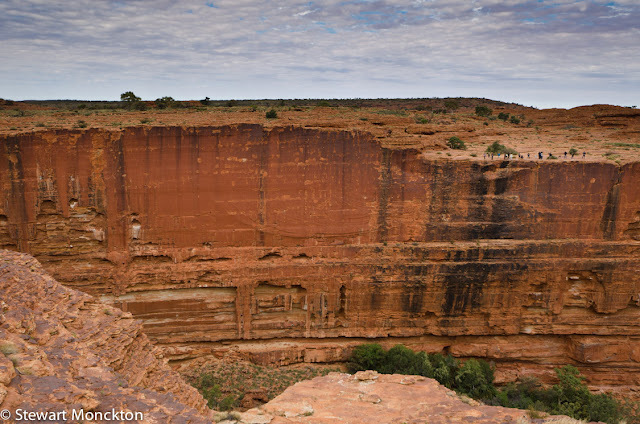 The walls of the canyon are clearly visible now, sheer and red. Patches of birdlime pockmark the faces, like climber’s chalk left by giant’s fingers. I watch for birds from the nest sites, but none seem to be at home. Once we arrive at the top of the steps most to the uphill for the day is behind us. The path skirts the top of the canyon, sometimes coming close the edge, often staying a discreet distance from the drop. Small rises and deep thin cracks make the path weave far from the straight and narrow, but this roughness hides the other walkers on the trail. Apart from the occasional glimpse of people on the path ahead, you could be on your own. The illusion is not really helped by the frequent, but not unwelcome, presence of painted arrows on the rock. And while the information boards and rescue radio stations hardly add to the sense of wilderness, this would be no place for unconstructed wandering. In places you can see the marine origin of the rocks. Lain down in the depth of an ancient ocean, laid down a sand grain at a time. And now being worn away, crack by crack, fragment by fragment. Standing on solid rock marked with the gentle ripple patterns of an eon old sea focuses the mind in a remarkable fashion. The same forces as today shaped the sea all those years ago. The same processes that made this ancient landscape are still at work. 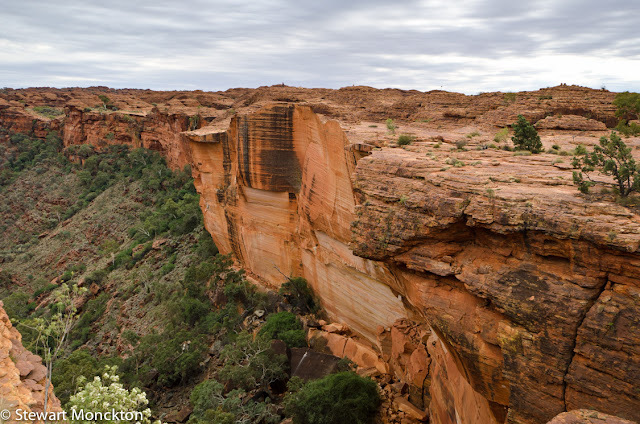 It took geologists years to work out that the present was the key to the past – and if you ever wanted to see evidence for this simple, but important idea you could do worse than come to Kings Canyon. All that was missing from the rocks to be today’s beach resort was the smell of chips, the call of the gulls and the embarrassed posturing of teenage boys as they try to talk to holidaying girls. 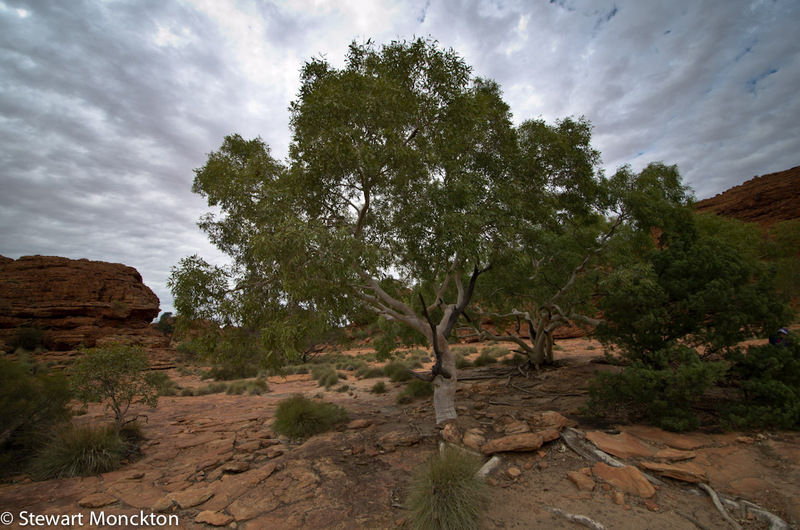 Battered looking gum trees, pale stemmed against the fevered red stone, wiggle their roots down through splinter cracks in the quest for water. 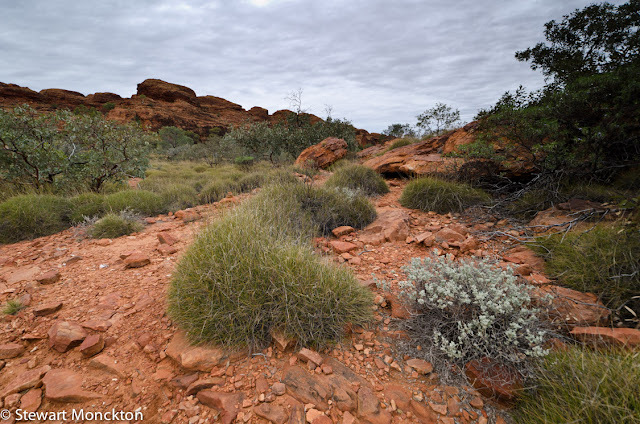 Ancient plants, the ghosts of an older wetter Australia, hide from the sunlight in wider cracks and darkened corners. Cycads that fed the dinosaurs linger here. We reach the head of the canyon, and have to head downhill, down metal steps with a convenient handrail and non-slip surfaces. This end of the canyon is called the Garden of Eden, and the safe steps mean it’s not a paradise for lawyers and ambulance chasers. Down in the base of the gorge the air is cooler – it would be a relief to be here in the summer – and a still, deep looking, water hole is half hidden under an overhang of rock. Branches reach out over the water. Wind blown vees cut over the surface of the water – in other places I would have thought of fish, but here, that seems unlikely. It takes no imagination at all to understand why this place could be held as special; harder in fact to understand how it could possibly be considered mundane. Finches call from the treetops. Water drips, silver, slippery, almost silent, from the rock. The metal steps ring hollow as we climb up the far face, back towards the rim of the canyon. Looking down from the rim the Garden of Eden lives up to its name. A canopy of green shades the red rock. Below the sharp razor drawn cliff face the plants are a soft, pliable coat of life in an otherwise barren looking scene. Across the canyon maw people walk close to the edge, seemingly unaware of the drop a trip step from where they stand. We sit safely distant, excitingly close, to the edge, and to the sounds of voices from the Eden below we eat a midday snack of apple. You really can hear the edge calling, inviting you to look down the face of red rock that makes this place famous. From the other side of the gorge it looks like it’s smooth, marked by horizontal lines that never quite make it to being ledges. In the centre of the face there is a bulge of rock, pushed beyond the vertical by the pressure from behind. It’s a remarkable sight / site, showing how time and the slow processes of nature can form the seemingly miraculously. Neither H nor I can resist the call of the face. We take off our bags, lie on the ground and worm wiggle out towards the edge. Space opens underneath us as our head and shoulders pass over the event horizon of the edge. Even with almost all of my body resting on solid ground I feel a strange sense of gravity. The pull, pull, pull of height battles with the sense of solid safety that comes up through the ground. H squeaks in an excited way. Nothing but air between our heads and the ground. Nothing between us and a sense of security but the imagination of falling. We worm back towards our bags and solid geology. We arrive back at the car, back to the start point of our circle walk. Back from the edge. Back from the top. ...I am left with the image of a car called Donald!! Another delightful post, filled with the sense of place and immediacy that is so appreciated. I enjoyed reading your post Stewart, a most wonderful adventure for you and your family. The photos of Kings Canyon remind me of here in the Desert Southwest , Grand Canyon and Momument Valley. I love dirt roads and the critters I find near them. If I saw the bums of the only wild camels in the world, I would definitely be snapping photos of camel bums! Loved this post. Fab shots Stewart! We did the over the edge thing too. Did I read read correctly, you saw camels? I would have had to stop and take more photos of the birds in the trees and the camel. The dingo is a cool sighting. What an adventure. Great post. That's an amazing canyon view, Stewart. I was only planning to put the Grand Canyon on my bucket list as I have never been there. Now, I need to add a lot more places. Thank you for your essay. Your writing style made me feel as if I was right there with you. My fingers are still buzzing from gripping the virtual steering wheel! The view from the edge was spectacular. You're writing is wonderful. Thanks for the post. Wow, you've gathered some fantastic images on this trip Stewart. Thanks for sharing (and for dropping by my blog again). Safe travels. I love to see the whole view from the top. 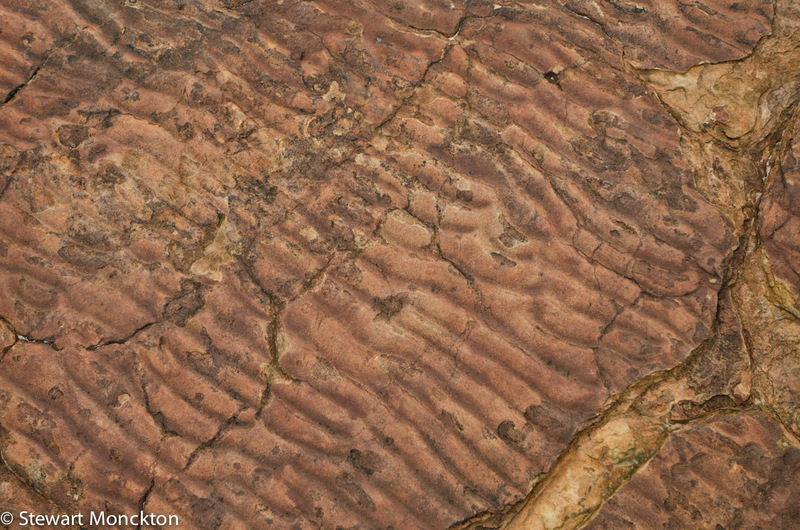 The red rock is simply amazing and everything around it is work of an art. I totally love your photos, it takes a lot of courage to take them. Interesting post Stewart!! !I know about the Australian camels and the dingo dogs! !Wonderful pictures!!! What an amazing place! I think I'm going to figure out a way to get over there. I'm not sure how, but I'm going to look into it. Fantastic photos and words Stewart.